Over/Under: Under 162.0 at 1.90 Bet Now! 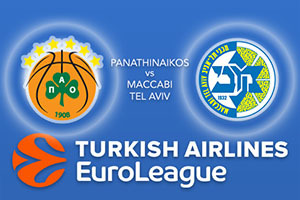 This is a game between two teams who are synonymous with the Euroleague, so it is likely that many fans will be tuning in to see this clash of the titans on Thursday night. This is going to be the 35th time these two sides have clashed in 35 years and at the moment; there is a slight edge with the Israeli side. Maccabi may be the away team this week but they have an advantage in that they have an 18-16 record in these fixtures. These two teams have been involved in three Championship games, which tells you all you need to know about the importance of these teams, and this game. The last time these sides clashed, two seasons ago, the home team was the victor in both of the games. The Greek side lost on the road in Overtime last week which means they will be desperate to bounce back strongly this week. One player who can be relied upon to do the damage is KC Rivers who has grabbed an average of 12.6 points per game this season. There is also Nick Calathes, who has provided an average of 12.4 points per game but who has also delivered an average of 6.8 rebounds, 7.6 assists and 1.8 steals per game. Add in Chris Singleton and you have the players that make a big difference for the Greek side. Maccabi are currently 2-3 this season and they’ll be looking for a big showing from Andrew Goudelock, who has provided an average of 18.4 points per game this season, a record which currently sits as third best in the league. There has also been an average of 15 points per game from Sonny Weems and Devin Smith so the Israeli side has players that can make a difference. The visitors defence is weaker though and this could be a turning point for this game. Much like the last season these two teams met, it looks like the hosts will triumph. This means you should take Panathinaikos Superfoods Athens at -5, which is available at odds of 1.90. Anyone looking for the Over/Under market should go UNDER 162.0 which you can find at odds of 1.90. Bet Now!